Everyone loves a good party. From the wonderful memories that a party provides, to the creative decorating that makes one special, a party is an event to remember. If you’re planning for an upcoming party, and looking for a new way to spruce up your festive décor, then consider a party table wrap from Apple Graphics. 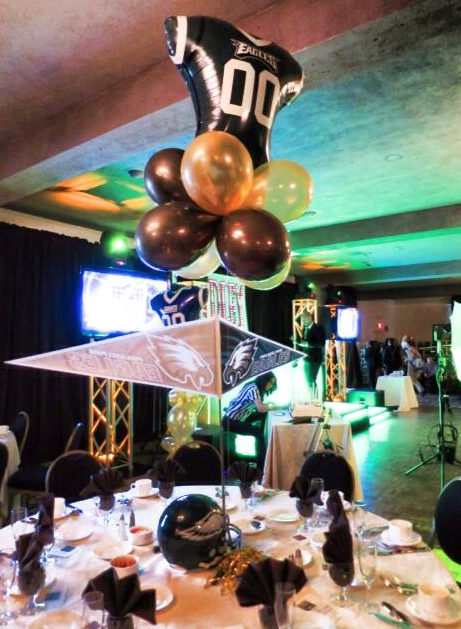 We take pride in all of our party installations, and we go above and beyond to ensure that your next party is a memorable one. 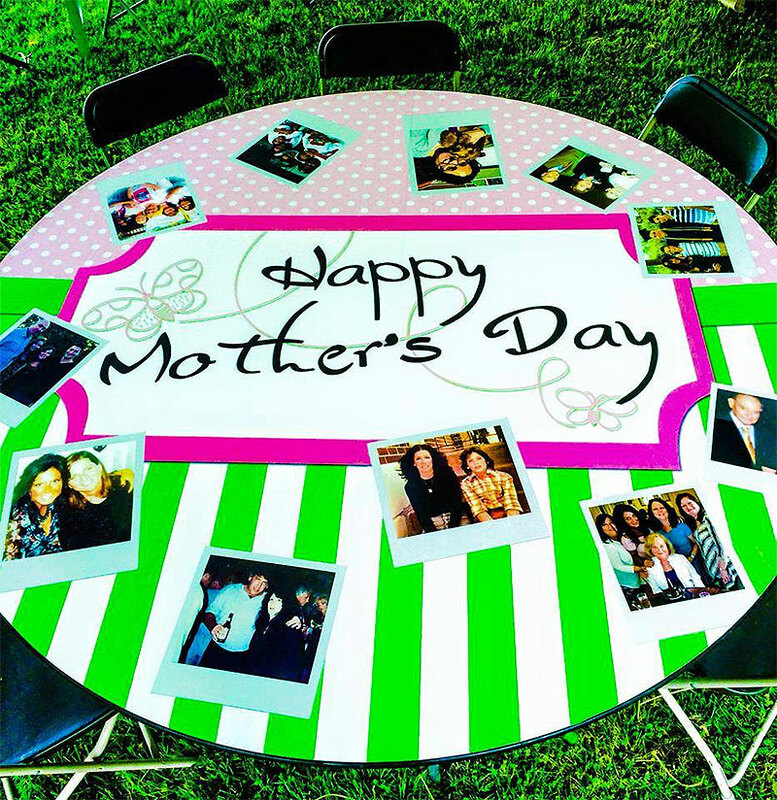 Party table wraps are one sure-fire way to make your guests remember the special occasion. 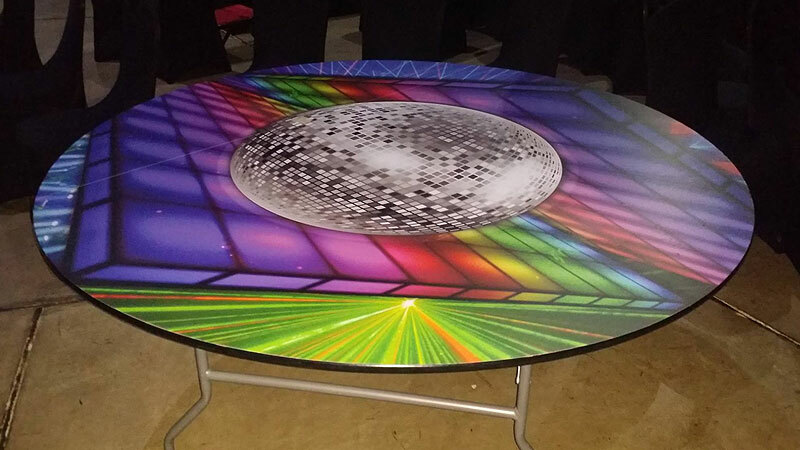 We all know how important it is to leave your friends and family with a good lasting impression and that’s why we go above and beyond to ensure that you’re fully satisfied with all of your party table wraps designed by Apple Graphics. Our skilled installers know what it takes to create something that you’ll be proud to display, and we will work with you to ensure you’re fully satisfied with whatever we produce. Why not step away from the ordinary and design a unique party wrap for your next special occasion? At Apple Graphics, we specialize in prints and graphics for all of your individual needs. No job is too complex for our skilled installation crew. We enjoy helping you design something both unique and customized for your occasion and we work diligently to ensure that you’re completely satisfied with whatever party wrap we’ve created. A party table can be something that all of your guests comment on from the time they enter your event until the time they leave. We can help you come up with creative images and even personalized photo images, as well. 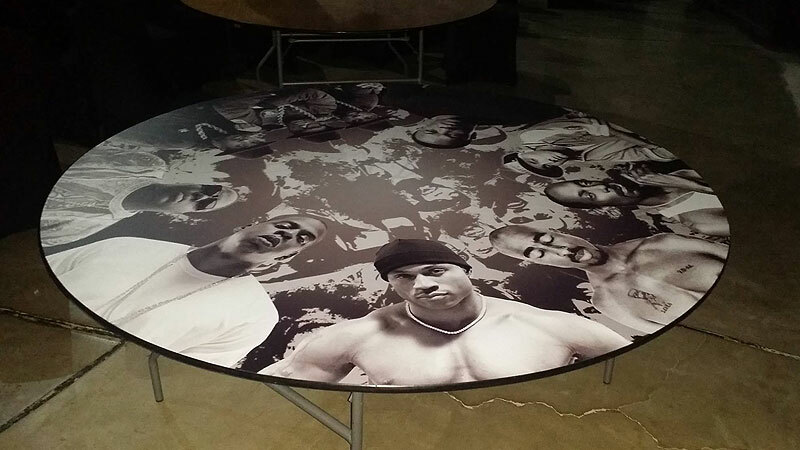 You have more than one option when it comes to creating a one of a kind table wrap for your next event. 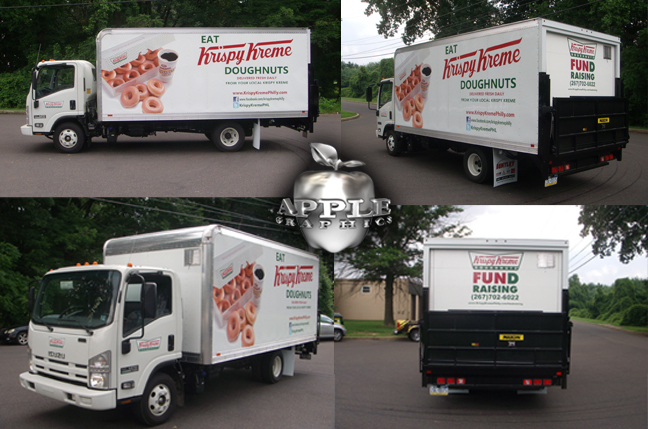 A custom wrap from Apple Graphics is guaranteed to leave your guests impressed with your creative flair. Our expert technicians will make sure that any questions you might have are answered, and they’ll also do whatever is necessary to ensure that you are completely satisfied with the finished product. For your next special occasion, why not consider a customized party wrap from our shop? We love helping people celebrate in style, and with one of our unique party wraps, you can be sure that your guests will leave with something to remember. 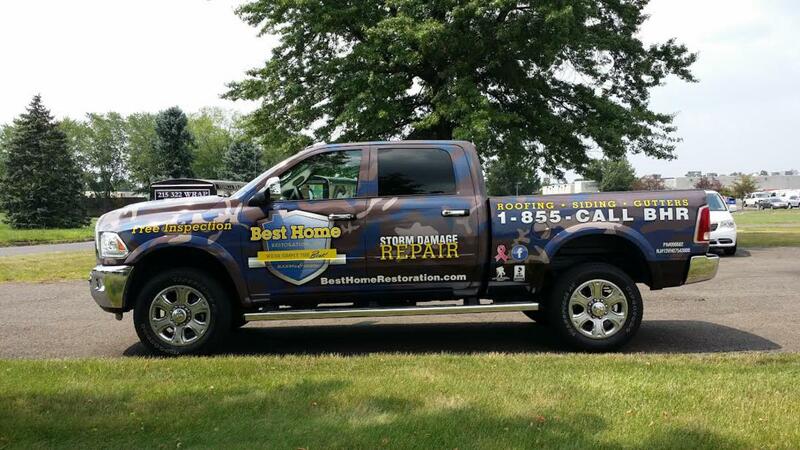 We are working with Best Home Restoration on custom wrapping vehicles of their fleet. 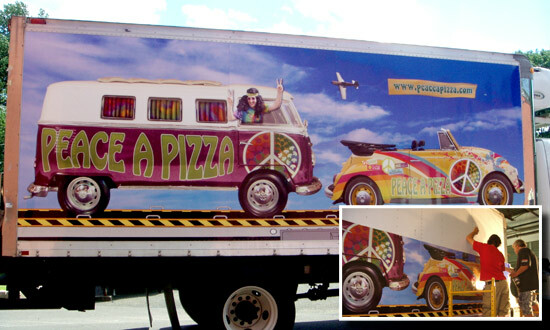 Fleet Graphics & Wraps is about the best way you can advertise your business. We love working with contractors, freelancers and new entrepreneurs who understand that mobile advertising will get you noticed and also help you brand your company in the area. Our talented designers will create the perfect concept for your business that will work with your set budget and will allow you to expose your company to potential clients and customers. All of our certified vehicle wrap installers are trained by the best in the industry and all have completed the Vehicle Wrap Training Course. 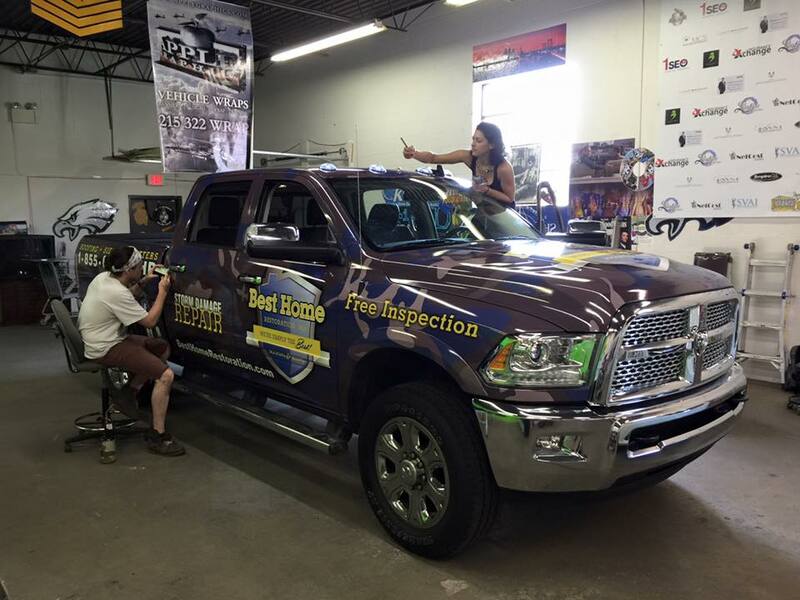 You can see at the photo below, our installers are wrapping up the latest pick-up truck for Best Home Restoration. Yes, we can pretty much wrap anything you bring over to us. Recently, we have fun designing a concept then printing and installing custom wraps to these featured clients. Our certified and highly trained install will get the job done to near perfection and to your total satisfaction. Check out these latest work of art and let us know what you think and if we can help you in anyway! We hope everyone is enjoying the Summer season! 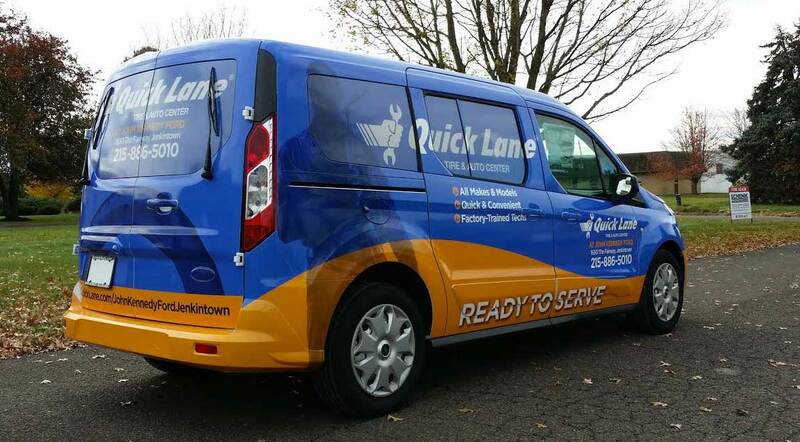 We are keeping very busy during these summer months and wrapping all kind of business vehicles: from small Mom and Pop 1-5 vehicle fleet to 20-30 commercial franchise fleets, we can take care of companies any size. The key to keeping a professional franchise / company image is brand consistency. It is important to keep the company brand visible, professional and to ensure the brand commnication is uniform all across the marketing landscape which includes vehicle wraps. 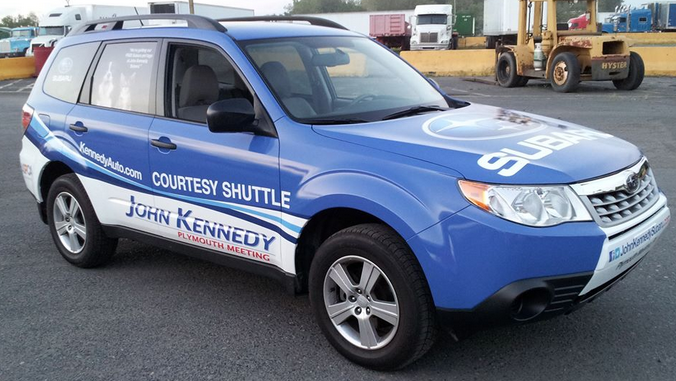 We wrap Franchise and Fleet cars, trucks, box trucks, vans and trailers. 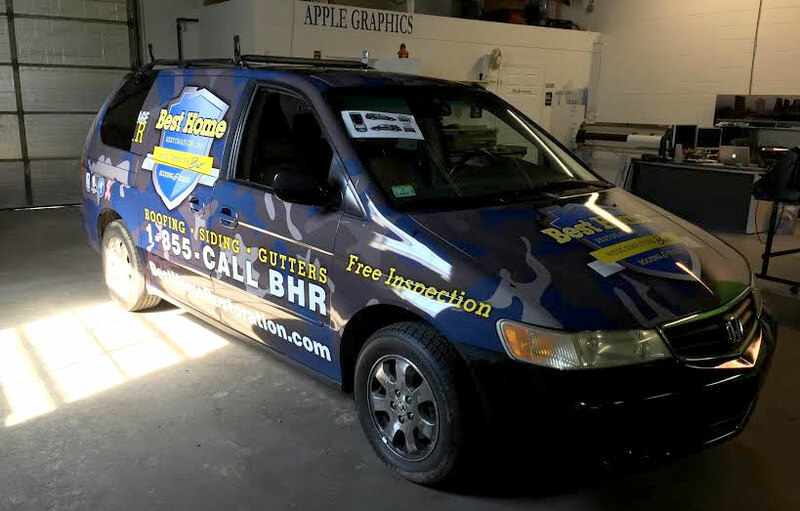 Our professionally equipted wrap shop has all the required tools to get the job done. We staff award winning wrap designers, highly trained Feller's certified and 3M prefered production and installation specialising. 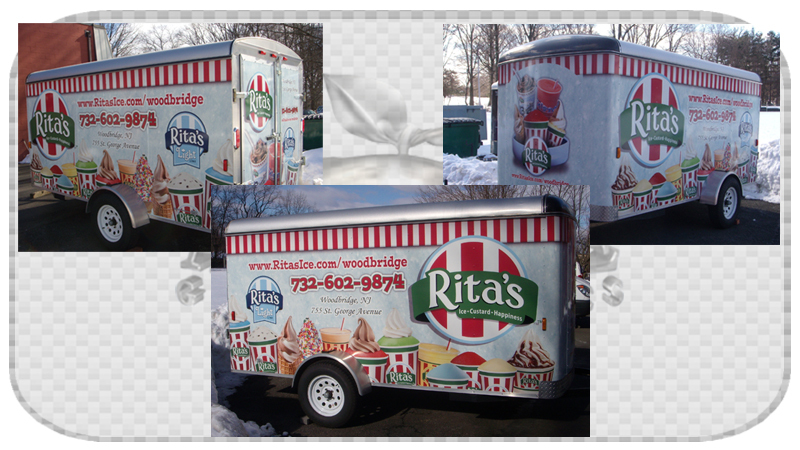 You can be sure we will deliver what we promis and beyond - Contact us or call 215-322-WRAP for a free consultation! At Apple Graphics, we are expanding our operations to better service the Atlantic Region! 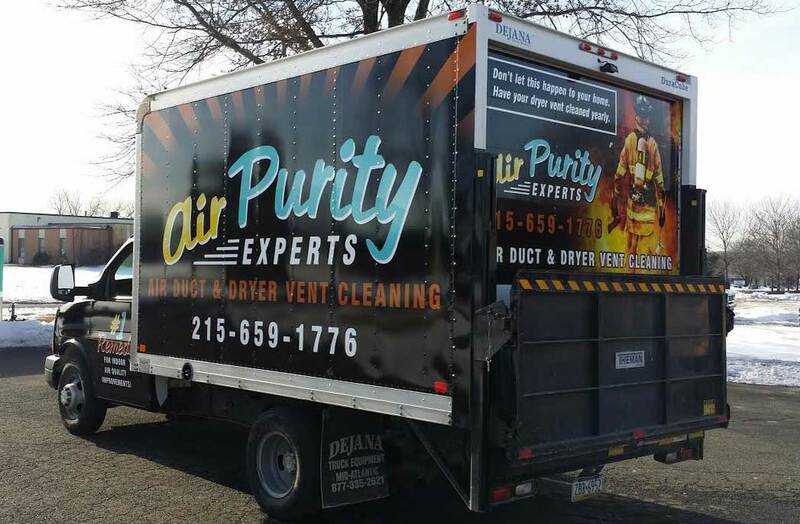 After years of providing high quality work in the tri-state area to a wide array of clients we are ready to take on larger territory and a higher volume of satisfied customers. 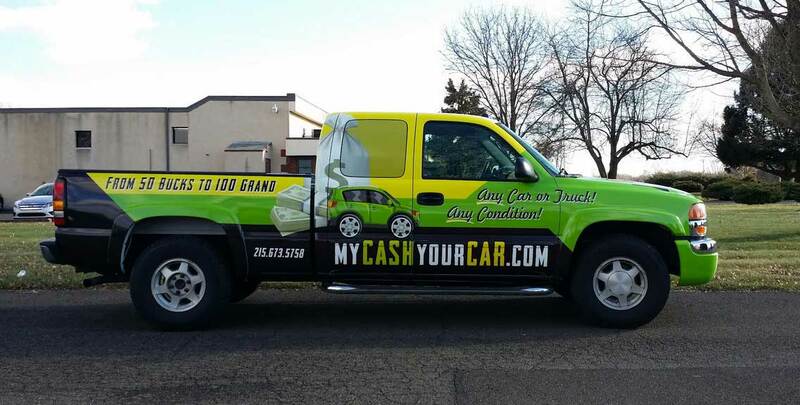 Our outstanding designers, diligent production specialists, and certified vehicle wrap installers are ready to handle all your mobile advertising needs. We are a one stop shop: from design & concept to completion. 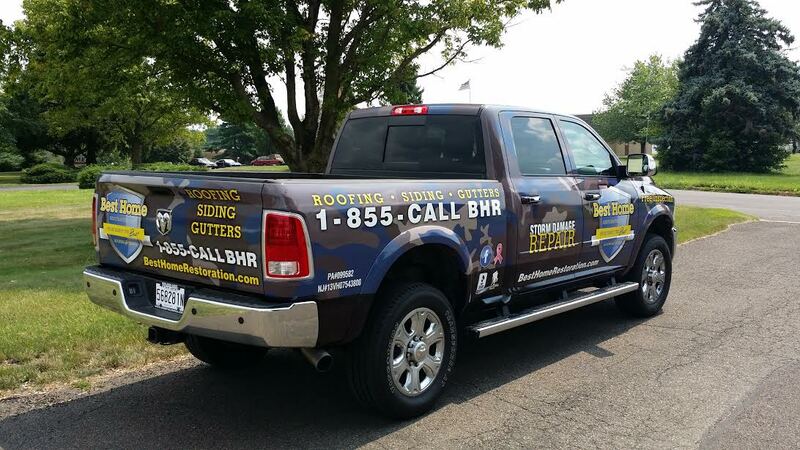 Vehicle wraps are all we do! Let us take care of your advertising needs! Wraps are among the techniques of new viral marketing campaigns, designed to draw as much attention as possible. Especially in larger cities like New York City, Washington DC, Atlanta GA, Charlotte NC, etc. these marketing ads can be highly effective over traditional means of print and radio. Don’t miss out on an opportunity to elevate you company’s brand recognition to the next level. Apple Graphics can help rise you up! Contact us today to disucss your project or advertising idea and one of our talented consultants will get in touch with you right away! 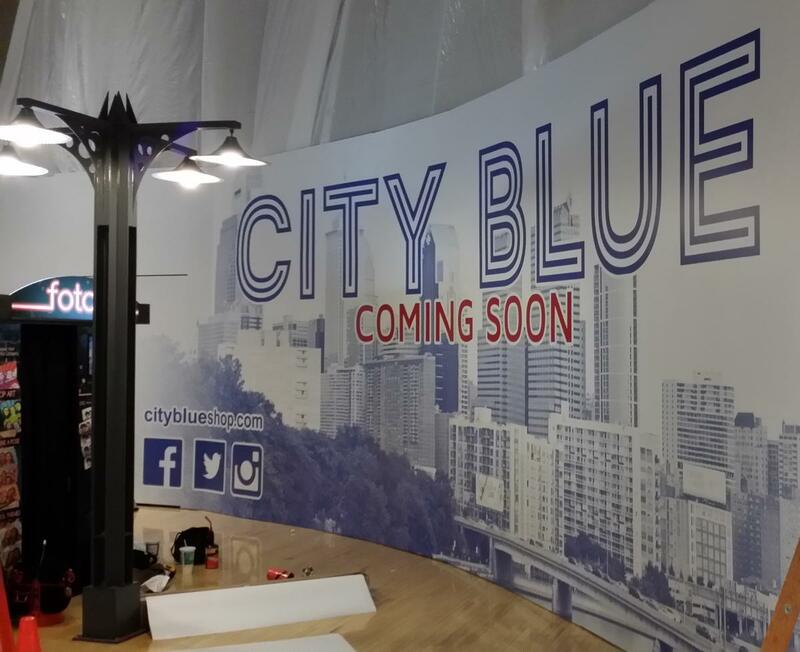 Our friends at City Blue are opening another store in Philadelphia Mills Mall and hired us to Wrap the Barricade while their store is being constructed. Here is a nice time-lapse video that shows the entire process. We love doing Barricade Wraps since this gives us a wide area to work with and plenty of space to create something awesome! Construction of new retail spaces can take a weeks to few months. Therefore, malls, airports and retail stores like to cover these spaces with barricades. The barricades are not very eye pleasing though as they are plain white and make the entire area look like “Under Construction.” Colorful Hight Dynamic graphics on barricades eliminate the need of painting them and also provide a warm, attractive appeal to customers. This barricade space can be used for advertising the products of the store that will be “Coming Soon” in a few months. Contact Apple Graphics to have us WRAP your Store Front Barricade and make a great impression to your store to come! We have officially moved over to a new Bucks County location! Our new Apple Graphics Inc Headquarters is 41 Industrial Drive Ivyland, PA 18974. 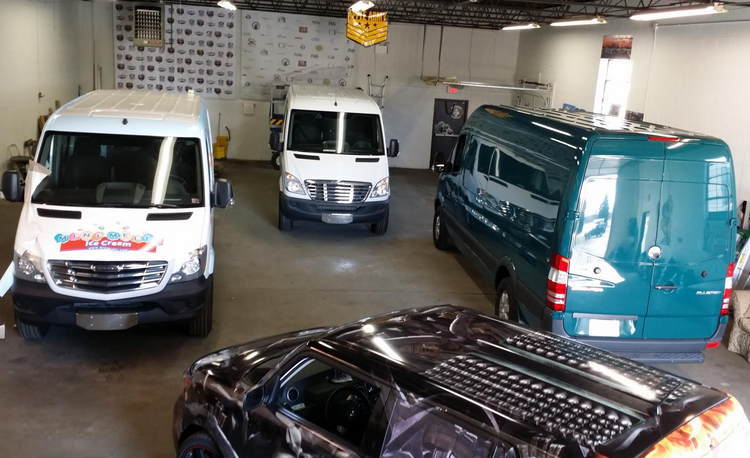 We expanded our Vehicle Wrap Shop and Garage to be able to take on more projects and better service our clients. We have added more wrap materials and equipment to stay up-to-date with wrap industry and technology. We invite all of our clients to tour our new facility and check us out at the new spot! 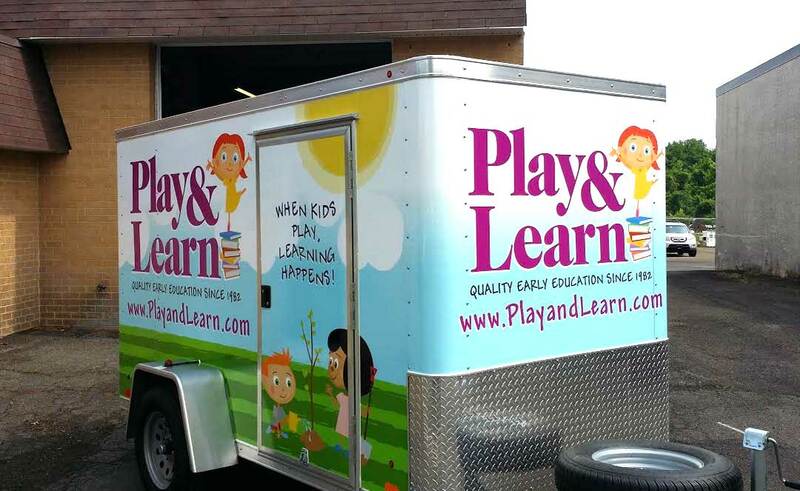 Vehicle Wrap Training schedule is filling up for 2015 - If you are looking to take your wrapping skills to the next level, reserve & schedule the wrap training before all dates fill up. Here is a photo of the recent wrap training from Muncy, PA. We traveled on location for a two day wrap training with the staff of Advertising Specialties. We had a great time training, Good Luck! 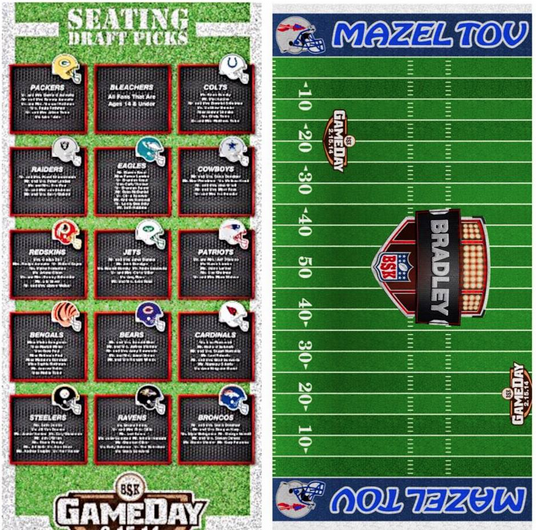 Theme Party Graphics for Bar Mitzvah, Bat Mitzvah & More! Thinking of planning you next party? Check out what Apple Graphics has to offer for your next event! Yes we said it, Parties. Apple Graphics is always exploring new avenues of the wrap world and even though the business side is more our specialty we have recently expanded our spectrum to the fun side. When planning a party whats one of the first hurdles you come to? Choosing a theme and how to execute that theme in such a way that your guests are blown away, this is where we come in. No matter your theme or environment your trying to achieve we can print any custom graphics that you would require. 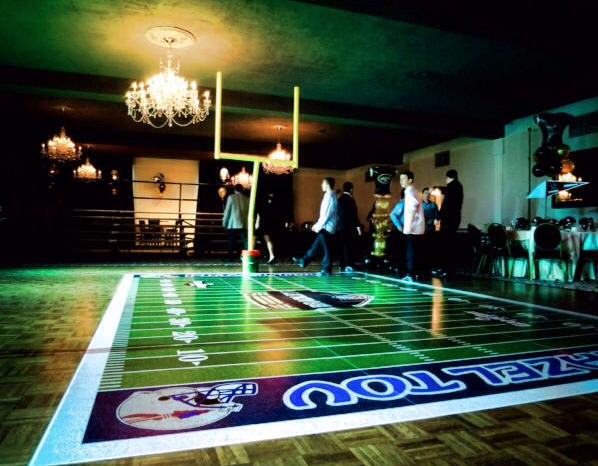 Recently we did a theme party a "Touchdown Bar Mitzvah" our first task was the floor, instead of just a plain old dance floor we wrapped the floor in custom football field graphics with the name of our guest of honor branded in the middle, and added goal posts at the end to give it a realistic look. 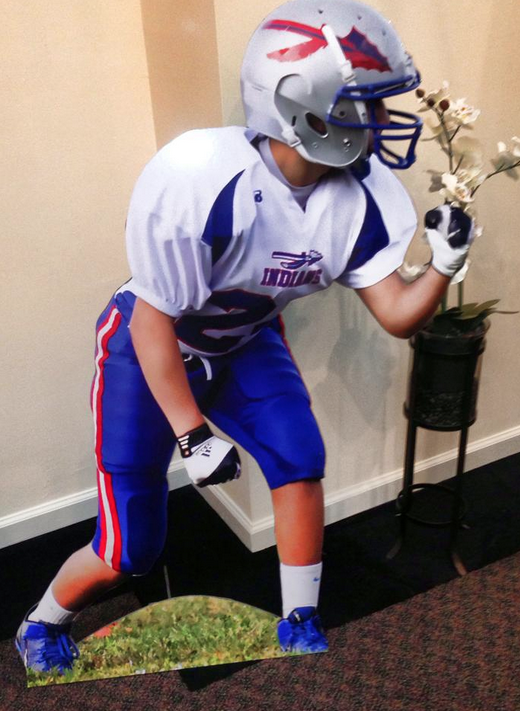 Next we did life size cut outs of the guest of honor, including a few football action shots to enhance the theme, some enlarged photos and banners with the guest of honors name along with the football team name that he plays for. Lastly was the entrance, This is where we really wanted to set the impression for what was going to be in store. 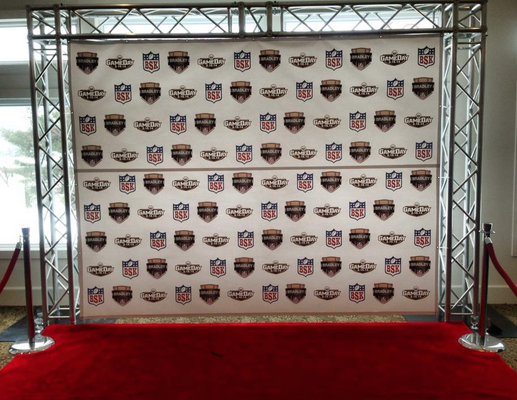 We created a red carpet back drop where our guests could come in and have their pictures taken as if they were celebrities, along with a custom seating chart to keep things organized and a huge sign board of the guest of honor posing on the cover of a custom designed "sports illustrated magazine", we also do custom invitations and install decals on virtually anything that you would want. 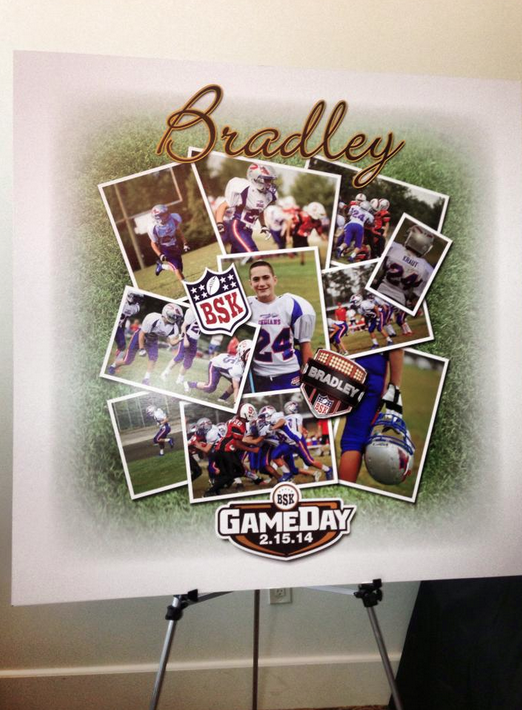 Whatever your interested in enlarged embarrassing pictures, wall or floor wraps, banners, etc. ​No matter your theme our in house graphic design team loves a challenge, we want to give you and your guests a unique experience by setting your party apart from the crowd with customizing. So think of Apple Graphics the next time your planning an event and think custom everything. Contact us for a custom Theme Party Graphic Estimate for you next event!